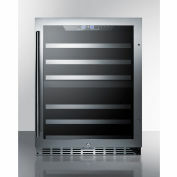 The SWBV3067B is a 30" wide wine and craft beer cooler designed for built-in installation under counters. 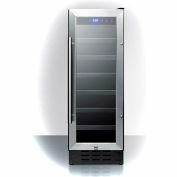 The fully finished black cabinet also allows freestanding use. 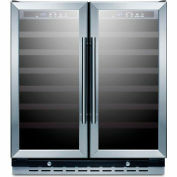 This unit includes two glass doors with a unique French door swing and seamless stainless steel trim. 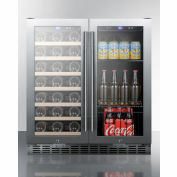 Both include factory installed locks and professional handles. A stainless steel kickplate completes the look. 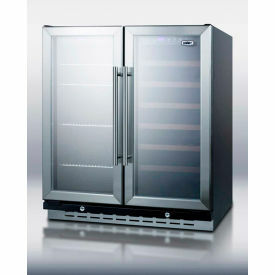 Two separate zones feature independent digital thermostats, letting you preserve red wine under warmer temperature conditions while keeping white wine or craft beer at colder temperatures. 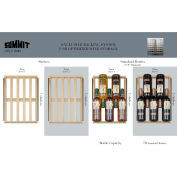 We provide six wooden wine shelves in a jet black finish and four wire chrome shelves, letting you arrange the shelving configuration to best suit your storage needs. Recessed LED lighting lets you display all items under an attractive, energy efficient glow.